The British flag is gone now, but it once flew over this fishing village as it grew to be a global powerhouse of trade, commerce and tourism on the eastern edge of Asia, reports western editor, Ted Davis in this week’s digital edition of Travel Courier. Arriving in 1841, British occupiers saw enormous potential in the way that Hong Kong Island and the Kowloon mainland circled Victoria Bay (now Victoria Harbour) to create an ideal, sheltered port – not to mention a commanding market position next door to China, in a stunning geographic location. Now, a sea of distinctive business towers on Hong Kong Island reach for the sky, facing the harbour with Victoria Peak rising steeply behind. The downtown business districts like Wan Chai, Sheung Wan and Central are so dense with city developments that it seems unlikely that any parts of the original Hong Kong would still exist. But they do, and they lie somewhat buried within the busy cityscape, waiting for discovery by visitors. These original enclaves of Hong Kong are most effectively toured on foot, giving full rein to random explorations. These will unfold in spots like Possession Street, Hollywood Road, Tai Ping Shan, Peaceful Hill, SoHo, PoHo and Lan Kwai Fong, to name some. An Old Town Central self-guided walking tour (by the Hong Kong Tourism Board) opens the door to these historic areas, many of which have evolved into trendy neighbourhoods where cafes and boutiques sit next to more traditional grocers and produce vendors – or even a coffin maker! These are the places where modern Hong Kong has its roots. For instance, the flowers and trees continue to thrive at tiny Possession Point under the looming business towers, where that first British flag was planted. An historic highlight on such a tour is the Man Mo Temple, one of the oldest and most venerated temples in Hong Kong, recognized for its ceramic figurines, wood carvings and plaster murals. But at the other end of the spectrum, both the PoHo and SoHo districts reflect the progression of the past to the future, with clusters of galleries and cafes, plus alleyways providing wall canvases for murals and graffiti art. Photo shoots with fashion models are also not uncommon here. Similarly, Peaceful Hill brings its own alternative vibe. 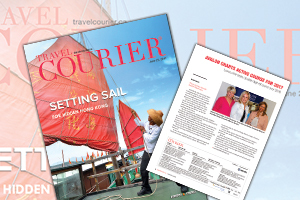 Get the full story in this week’s digital edition of Travel Courier.